Do you wince or hold your mouth when eating cold foods such as ice cream, or when swallowing the ice in your drinks? Do you have pain from sensitive teeth? If this sounds like you, the good news is you don’t have to live with it! There are various products and treatments available for your particular sensitivity, you just need to find out what is causing the particular sensitive condition you have and find out what product it will respond to and what works for you. However, you might have to try more than one to find your desensitising buddy. Like any problem, you can only find a solution if you know what’s causing it. Your tooth enamel (called Intact enamel) is the outer layer of your teeth which protects the underlying sensitive part of the tooth called dentine and if this layer is breached or thinned it will cause sensitivity and unfortunately sometimes pain! A filling is said to be leaky when the side of the filling doesn’t fit tightly against the tooth. Debris and saliva can then seep down between the filling and the tooth. This can lead to decay, discoloration or sensitivity. 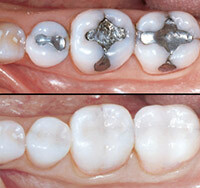 Both amalgam and composite fillings can leak. Dental amalgam is a man made substance used to fill cavities. These are the most common form of fillings (used by the NHS) and are also mostly commonly known as “silver fillings”. They are silver in colour but in fact are a mixture of metals such as zinc, indium, mercury and of course silver. The benefits of amalgam fillings are that they cost less than other types of fillings and they also last longer over time especially with teeth that are often pressured and wear away from chewing a range of foods. Tooth-coloured materials now can be used to restore teeth. Therefore, amalgam is used less often than in the past. However, the newer materials can’t be used for all situations. Resin composite fillings are made of both a ceramic and plastic compound. The colour of the resin mimics the appearance of natural teeth, these fillings blend right in so they are also known as “white fillings” or “tooth-coloured fillings.” This type of filling is more aesthetically pleasing to some clients who have wide smiles, laugh a lot or throw their heads back. Also a lot of singers and performers prefer the white filling option as the camera often focusses on their mouths as they talk or sing and this is particularly a concern with newer high definition cameras who pick up the smallest details and perceived imperfections! Sensitisivity due to teeth whitening products is normally transient and vanishes once the treatment is over, but if you have used products from the internet or people who are carrying out the treatment without the necessary qualifications you might be in trouble. Please only use dental teeth whitening products that are recommended by your trusted Dentist. They have spent many years training in oral and dental health and really want the best treatment for you. Some of the above mentioned products are available from your local pharmacy and supermarkets in the dental section, but some are not available over the counter and will have to be provided (and applied) by a fully qualified healthcare professional. In some cases, custom made application trays will be provided to help the material stay on your teeth for longer, giving it more time to soak into the tooth structure and this may be the only way to manage your particular sensitivity. The plastic trays used are pretty much similar to the ones used for teeth whitening. So once the sensitivity is over you can progress onto a course of teeth whitening and kill two birds with one stone! And don’t forget to ask for a discount! Gum recession is the term used to describe where the margin of the gum surrounding the teeth wears away, or pulls away from the tooth, exposing more of the tooth, or the tooth’s root. When gums recede with age, gaps or ledges can form between the gum and tooth, allowing disease-causing bacteria to build up. To prevent this Dentist’s recommend you use dental floss or individual tooth brushes (such as the TePe Brand) on a daily basis to get to those hard to reach areas between your teeth where an ordinary manual or electric toothbrush cannot otherwise reach. You just apply a tiny amount of your toothpaste on to the brush and target the particular area that needs special attention. A cracked tooth could be caused by a filling that causes the tooth to weaken, such as if there is a large filling in the tooth or if you have had an accident or by eating hard foods such as ice or hard sweets. If a small fracture occurs then this will provide an “in” for dentine to possibly be exposed and thus tooth sensitivity may begin. Teeth can crack because of a variety of reasons including pressure from teeth grinding, large fillings, chewing or biting hard foods, such as ice, nuts, or hard sweets, trauma to the mouth, such as with a car accident, sporting injury, fall or fight, abrupt changes in temperature in the mouth — for instance, from eating something extremely hot and then trying to cool your mouth with icy water and finally, with age as most teeth cracks occur in people over 50 years old. Over time and with age your teeth can wear down, like the rest of your face and body. If you particularly like chewing hard foods or ice in your drinks, then this wearing down can be sped up. If you drink a lot of fizzy and acidic drinks and are not absolutely vigilant with your oral hygiene, brushing your teeth and gums at least twice a day, then over time the toll of bathing your teeth in sugary and acidic drinks will mean that they wear down more quickly than having a lifestyle where you drink lots of still water instead, either with or between meals. Some people are very conscious of their oral and overall hygiene and can sometimes over do it! If you can imagine brushing any particular area strongly or over a long period of time then that area would wear down quicker. Think of stone steps and how over years the stone area which has the most footfall is worn down far quicker than areas of stone that are not often walked on. Some people clench or grind their teeth through habit or stress, either in the day or night time and you can imagine over time this puts greater stress on your teeth and makes them wear down more quickly. If this is you, then you should ask for advice from your Dentist on how you can reduce or prevent this and save your teeth over the long term. If you are suffering from dental sensitivity and have tried over the counter products such as sensitive toothpaste or sensitive mouthwashes, or the problem is recurring, then you should contact Dr Aisha and her team to make an appointment so that you don’t have to suffer from this preventable condition. Just call 0161 969 7464 and you are on your way to fixing the problem. If you have any further questions, please don’t hesitate to get in touch for FREE advice on your dental health.